My name is Giang. I have a disabled daughter who has been attending CHIA since she was 19 months old. I started coming to CHIA with her in 2013 and I was then employed as therapist in 2014. I provide physiotherapy to the children and I cook for them every day, bathe them and give them their medications. I really enjoy working with CHIA and I like helping the parents to understand and also learn the therapies, so they can do it at home. 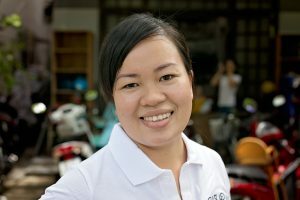 My job gives me great satisfaction because I know I am helping not only the children, but their families too – having a disabled child myself, I understand the difficulties of raising one in Vietnam and I can empathise with these families.